JERUSALEM — An international meeting here June 4 appealed for world pressure on the Israeli government to negotiate with the PLO to achieve a comprehensive and just peace. 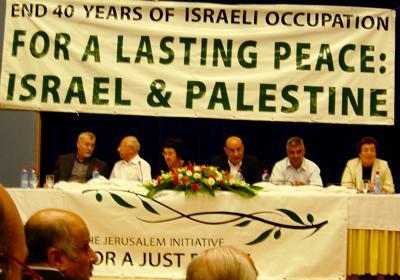 The conference, titled the Jerusalem Initiative for Just Peace on the Basis of Two States: Israel and Palestine, was an unprecedented joint undertaking of the Palestinian People’s Party and the Communist Party of Israel, marking the 40th anniversary of the Israeli occupation of Palestinian territories, and the 60th anniversary of the 1947 UN partition plan for establishment of the two states. 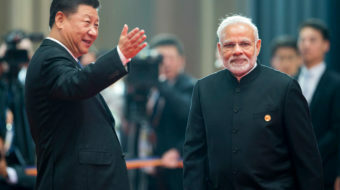 It was attended by representatives of communist, socialist and left parties from nine European countries, India and Australia, and the Communist Party USA. Among them were several members of parliaments. In a joint statement, the participants underscored the “right of the Palestinian people to elect their government and all institutions without any external intervention.” They called for Israel, the United States, European Union and other countries to end their economic siege against the Palestinian national unity government, and for negotiations based on: ending the Israeli occupation, dismantling all Israeli settlements in Palestinian territories, establishing the June 4, 1967, boundaries as a peaceful border between the states of Israel and Palestine, co-existence of the capitals of Israel and Palestine in Jerusalem, release of all Palestinian political prisoners (now numbering some 11,000), and a solution to the refugee problem in compliance with UN Resolution 194. “We are aware that we cannot achieve an end to the occupation and independence by ourselves,” Rizeq said. Earlier, PPP leader Hanna Amireh said the public meeting of Israelis and Palestinians would “prove there are partners for a just peace based on UN resolutions.” He added, “It is very important for Palestinians to see there is an international dimension, that they are not alone.” Otherwise, despair will fuel self-destructive violence, he said. Israel is paying a heavy economic and social price for the occupation, including growing poverty and instability, Shlomo Swirski of the Tel-Aviv-based Adva Center told the conference. “Without peace, there is no future for Israel,” said Israeli CP leader Tamar Gozansky, a former 12-year Knesset member. She noted that hundreds of Israeli organizations were planning protests against the 40 years of occupation. “The majority of Israeli people are disappointed” in the current situation, she said. His comments were delivered by Dr. Emil Jarjoui, a member of the PLO Executive Committee, at the evening event attended by several hundred Israelis and Palestinians. 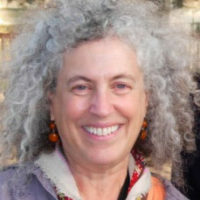 Conference participants saw first-hand the escalated measures taken by the Israeli government in the last few years to impose “facts on the ground.” They saw vast Israeli “settlements” — huge housing complexes penetrating the landscape of the West Bank, especially around East Jerusalem. They saw the “Separation Wall” snaking around and through Palestinian communities, pulling West Bank land into the Israeli side and shredding Palestinian civic life. They saw some of the more than 600 Israeli checkpoints that permeate the West Bank, and learned of the labyrinth of IDs, passes, permits and punitive actions that have made Palestinians strangers in their own land.